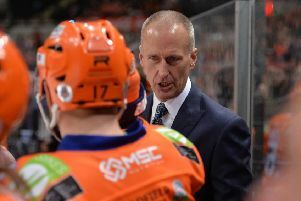 A barnstorming third-period fightback by Manchester Storm brought a shuddering halt to Sheffield Steelers’ recent resurgence. Heading into Storm’s Altrincham rink on the back of a three-game winning streak – including a hard-fought 6-4 triumph over Manchester in Sheffield on Saturday – there was renewed hope that the Steelers would be able to carry their positive form into the new year. But, as has happened a number of times this season, such consisatency proved elusive and they now go into this weekend’s double header at second-placed Belfast Giants on a slightly sour note. Mid-season signing Anthony DeLuca had already show signs of adjusting to the demands of the Elite League in recent days, having scored the winning shoot-out goal at Nottingham Panthers on Boxing Day before a skilful solo effort against Manchetser on home ice three days later. And even though he backed up his claims to be a top-six forward under head coach Tom Barrasso with a hat-trick across the other side of the Pennines, his efforts proved in vain as former Steelers player and coach Ryan Finnerty’s quickly-improving side ran out 5-3 victors. The Steelers couldn’t have asked for a better start to the game when they found themselves 2-0 up inside the first two minutes. Manchester's Dallas Ehrhardt celebrates his goal against Sheffield Steelers. Picture: Mark Ferriss/EIHL. DeLuca first got on the board at 59 seconds, before following that up with a second just 15 seconds later. The hosts rallied impressively, however, and halved the deficit at 7.34 through a power play goal from Mike Hammond, who had also opened his team’s account in Sheffield three nights earlier. The Storm were level before the end of the first period too when Dallas Ehrhardt struck with just 19 seconds remaining on the clock. As in the first period, the Steelers were on the board early again after the restart, DeLuca registering his hat-trick with just 86 seconds of the second period gone. That was how it stayed until the third period, when three goals in a little under 10 minutes determined the outcome. Dane Byers equalised on the power play at 46.29 before Linden Springer gave the hosts the lead for the first time at 49.13. Ciaran Long then made the two points safe with just under four minutes remaining.